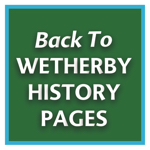 Wetherby is steeped in racing history, with evidence of a meeting near Netherby as early as 206 AD when the Emperor and Conqueror Severus organised races in the vicinity of the town. The north bank of the River Wharfe has a long history of racing horses and it is there that the Wetherby story begins with the Vikings stabling and training their horses in nearby Follifoot and the Romans racing their Arab horses a few miles upstream at Netherby. 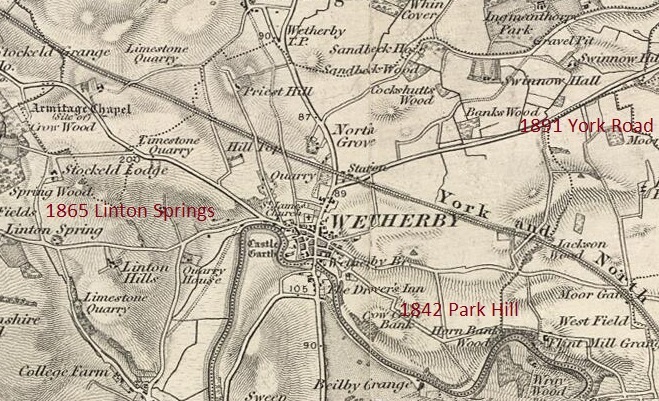 Over 1600 years later a meeting was held at Park Hill on Tuesday 15th February 1842, while chase meetings took place at Linton Springs on the banks of the River Wharfe, between Wetherby and Netherby. Clear evidence remains of a Grand National Hunt Committee race in 1865 which was won by Emperor, owned by Henry Chaplin; the racecard still surviving to this day is displayed in the Crown Hotel. The Wetherby Hunt Committee organised a meeting at Linton on 20th April 1874 featuring the Open Hunters’ Steeplechase sponsored by the Mayor of Leeds, who donated a silver cup which was won by Number One owned by Mr R Barker. However, after the tenants of the ground at Linton raised their rents to such an extent in 1890, the committee decided to look for an alternative venue. A course on the York Road looked ideal and there was hurried preparation for the first meeting which took place on Easter Monday 30th March 1891, opening with a race won by the 4/6 favourite Alberta. In 1906 the grandstand was opened, but by 1915 racing had ceased due to the war, when a hospital was erected on the course. 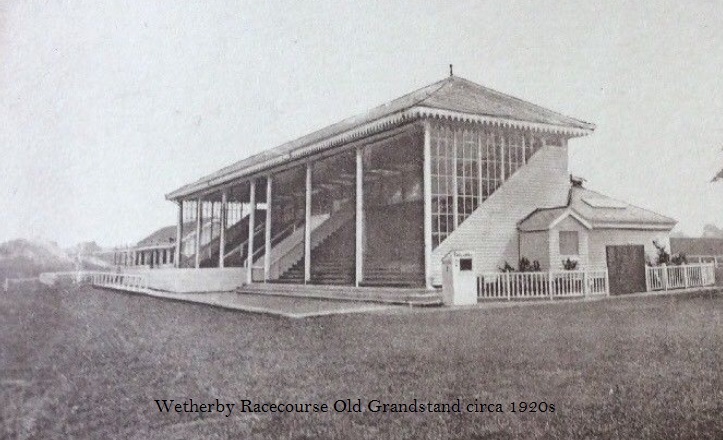 When racing resumed the Wetherby Race Company was formed in 1920 and set about the process of purchasing the racecourse lease, making one of its members, Rowland Meyrick, the Clerk of the Course. It was a royal year for Wetherby in 1923, with Princess Mary attending the Easter meeting and Prince Henry attending at Whitsun. In the following year, 1929, a racecourse railway station was opened adjoining the racecourse and operated until the closure of the branch in 1959. Between 1939 and 1945 racing ceased again, the course being used as an Army camp, but in 1953 the freehold rights were purchased and in 1967 the new Club Stand was opened by Lord Willoughby de Broke. 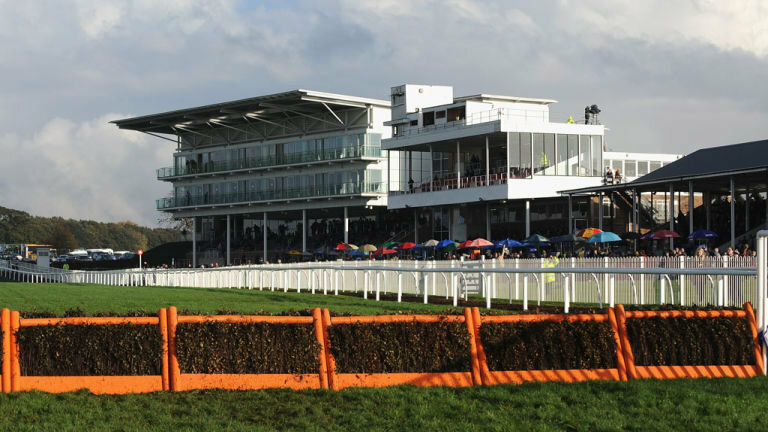 The new Millennium Stand, costing £4 million, was opened in February 2000, and in 2015 it was decided to stage Flat meetings as well as jumps. The city of Leeds tried in vain to establish a permanent racecourse at a number of venues across the city over a number of years. Perhaps the best period of racing for the city was from 1824 to 1832 when meetings were staged at Haigh Park. The meetings were close enough to the city centre to attract racegoers, yet far enough away to discourage developers. The course had high profile supporters like Lord Fitzwilliam and Lord Scarborough, and important races like the Haigh Park Gold Cup and Yorkshire Stakes, but the meeting literally became dead in the water when the Aire and Calder Navigational Company redirected the course of the river to run straight through the heart of the racecourse.